Even though our country is blessed with wide varieties of soils with high fertility, it is being degraded day by day by various natural and human activities. Farmers in India are complaining about low productivity because of various reasons and soil degradation is one of them. Loss of soil fertility results in low productivity. It also results in high cost-of-production, low income, food scarcity, loss of biodiversity etc. As food security is a major concern, India has to overcome the challenge of low productivity due to soil degradation. Conservation of soil is the only way to override this problem. Among the agents, water is considered as the main cause of soil erosion. Removal of the top layer of soil by various means, which include both natural events and human activities, is called as soil erosion. Sheet Erosion: Uniform removal of the top soil just like a sheet. Rill Erosion: Heavy water flow cause rill in Land. Note: Wind erosion also causes sheet and rill erosions. Note: The largest area affected by soil erosion in India is the State of Rajasthan followed Madhya Pradesh. Fertility of top soil will be lost. 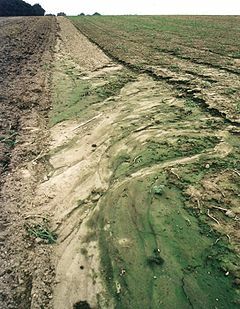 Nutrients content will decline as they are washed away by erosion. Underground water level will be reduced. Loss of vegetation and habitat. Drought and flood become frequent. Adversely affect the economy and culture. Natural hideouts are formed when gully erosion occurs (Ex: Chambal valley was famous for criminal’s hideout). Soil fertility is mostly affected in the states of Punjab, Haryana, and U.P. It is a condition when the soil is not giving enough production even though adequate irrigation and nutrients are supplied. Land should left uncultivated for a period of time and let to retain its fertility. Cropping after cropping will leave the land unfertile. Leguminous plants can be cultivated in intervals which will increase the fertility of the soil. If there is no proper drainage system in the land, the land will become waterlogged. This results in the saturation of crops. The normal circulation of air will not be possible due to water logging and the amount of oxygen in the soil will decline. Construction of proper drainage system to allow water flow away from the land is the best way to reduce water logging. Soil will become saline or alkaline in low rainfall areas. Rajasthan is an example. When the sea water enters the land, the soil becomes saline. The presence of calcium carbonate beneath (kankar) the soil will act as impermeable to water and water gets logged as happened in Indira Gandhi canal regions of Rajasthan. If the soil contains salt content, it will spread to the whole land due to this. It is a type of slash and burn method of cultivation. After reaping the crops, the land (usually the forest) is slashed and burned. The next cultivation will be in another plot and the burned land will let uncultivated for a period. In the early periods, the gap between two cultivations in a land was 10-20 years. Due to population increase and availability of land is reduced, the gap decreased to merely 2-3 years. This causes major deforestation, environmental pollution, loss of habitat for wild animals etc. The burning of forest results in soil erosion and gradual degradation of soil. Contour ploughing (cultivation against the direction of the wind). Strip cultivation (cultivation in strips). Flood control by government initiatives. Wind breaks in land; like trees at borders. Leveling of gullies, ravines etc. Control of chemical fertilizers and pesticides in the market. Proper awareness about the need of conservation. Organic farming has a role to play in soil conservation. Sheet erosion results in the formation of gullies resulting in loss of underground soil. The largest area affected by soil erosion in India is the State of Rajasthan followed Madhya Pradesh. Explanation: In case of sheet erosion, there will be a uniform removal of the top soil just like a sheet.